You wake at 10:00 and throw back the shutters to brilliant sunshine flooding your private patio. The pool is a minute's walk away, you're 10 minutes from a Mediterranean beach, and there are 3 golf courses on your doorstep. Today you could enjoy a nearby waterpark with your family, or perhaps take a drive between the orange groves up to San Miguel's open-air market. Where would you rather be? You can decide over breakfast of fresh fruit and real coffee on the front porch of Alegría, your comfortable holiday apartment on the Costa Blanca. Air conditioned with all the home comforts, including modern kitchen with washing machine, cable TV, CD/radio, hair dryer, BBQ grill, DVD player, microwave, iron...WIFI also available on request. South facing for winter sun, Alegría is at easy-access street level, just steps from the enclosed communal pool and a short walk from shops, restaurants and bars. Ideal for families, golfers, sun seekers, couples young & old. Alicante/Murcia airports just 45/30 minutes' drive away-EASY! Enjoy the Costa Blanca! : The Costa Blanca, known as 'The White Coast', boasts an average of 320 days of sunshine per year. Combine that with the soft, dry climate created by the area's salt lakes and mineral deposits and you have what the World Health Organisation has declared the healthiest place to live in Europe. Okay, so maybe you can't live there, but you could spend a week or two enjoying long, lazy days on the beach or poolside, strolling down Torrevieja's promenade, wandering through open-air markets and savouring the local cuisine in sun-filled village squares. From family fun parks to championship golf courses, modern shopping centres to historic cathedrals, orange groves to vineyards, metropolitan restaurants to tiny cafes--you will find it all within an hour's drive of Alegría! Towels, bath mat, soap and hair dryer provided. Please bring your own beach towels. 'Alegria' is a family-friendly, self-catering apartment with all the comforts of home. There is curb-side parking just outside your door and your own sunny patio to be enjoyed all year round. The cable TV system receives all English channels as well as movie and sports channels, and the DVD player (bring your own DVDs) offers additional indoor entertainment. There is some light reading in the book case, and a CD player is also available (bring your own music). An internet cafe and pay phone are just up the street. However, since the Costa Blanca boasts 320 days a year of sunshine, most people live outdoors; the large communal swimming pool is secure for residents only, and is only steps from your front door. Your private patio has a picnic table and four chairs, as well as a BBQ grill for those long sunny evenings. Please NOTE: NO SMOKING inside the apartment. I have stayed here several times over recent years. It’s a great base for a sunshine break. This year has seen some new patio furniture and some soft furnishing changes which have made a difference. We stayed at this apartment for 9 nights. As a family of 5, who love all inclusive holidays we were apprehensive about going self-catering and wondering how we would fill our days. The apartment is clean and has everything possible you would need for catering for a family of 5. 2 Bedrooms and a sofa bed, with every kitchen utensil you would need. It has a great space out the front for eating and just chilling but keeping the kids at one place. The swimming pool is 2 doors down and my children had hours of fun from breakfast to bedtime they would have happily stayed in the pool. The supermarket and eateries are within walking distance (no more than 10 minutes) and the food is cheap and cheerful!! If you are a beach lover, then a car is needed. Thanks so much for this lovely and informative review. --glad you enjoyed yourselves! A real "home from home". Everything close by. An excellent apartment - very clean, comfortable bed, good shower with plenty of hot water, lovely patio, well-equipped (good kitchen, BBQ with charcoal, sun loungers & patio furniture, extras ( shampoo, shower gel, washing up liquid, washing powder, etc.)). Shared pool and handy parking. Wifi was excellent. British TV channels. Location very good - easy walking distance to supermarket, bars and restaurants. Straightforward drive from Alicante airport. Short drive to beaches and other areas of the resort. We took day trips to Alicante, Torrevieja, Murcia, Cartagena, mountains. This is a great place for a relaxing stay. The sun shines on the patio all day - we ate all our meals there. With regards to the booking, responses from Elaine were quick and there were no issues. Thanks so much for this great review! 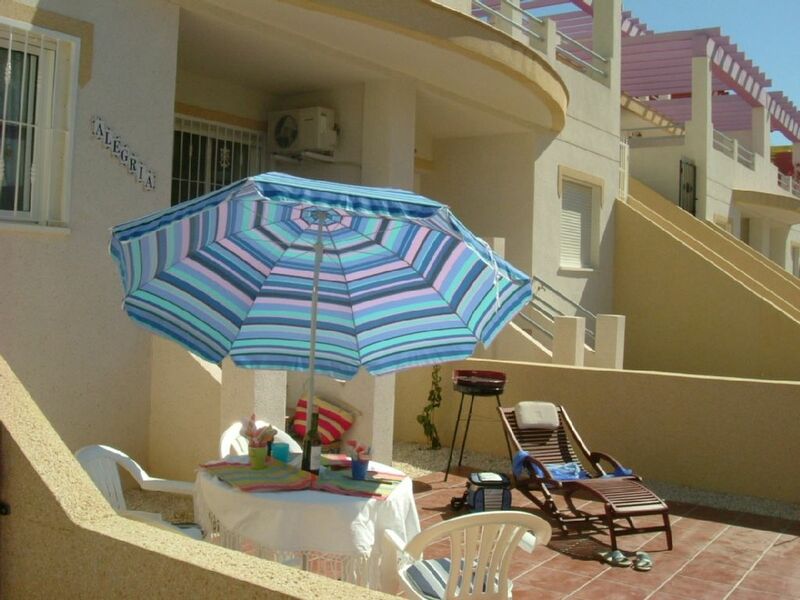 Glad you enjoyed your stay and thank you for helping others find my little sun trap on the Costa Blanca. Next year's calendar is starting to fill up, but I'll keep you a place on the booking calendar if you want to return for more patio BBQ's and sun lounging! Alegria, a street-level apartment in the colourful, terraced complex of Vista Golf, was chosen for its unique layout and ideal location on the Costa Blanca. Just 45 minutes from Alicante airport on the N332, or 30 minutes from Murcia on the AP7, Alegria is situated on a quiet residential street, yet within walking distance of bars, restaurants, an internet cafe and a supermarket. A championship golf course, Villamartin, along with 2 other fabulous greens--Las Ramblas and Campoamor, are within 10 minutes drive, as are several Blue Flag beaches, including La Zenia, Playa Flamenca and Campoamor. Or drive down the coast to enjoy the soft, mineral-laden air and try out a healthy mud bath at the Mar Menor. Visit shops, water parks, and sea-side promenades at nearby Torrevieja, enjoy a savoury Paella in historic Yecla, taste Jumilla's wines and buy fresh olives in a different open-air market village every day of the week. Then come 'home' to Alegria and watch the sunset from your pool side. Please NOTE: A CLEANING FEE OF €60 is payable on arrival. This fee is charged regardless of length of stay. It's easy to pay by credit card using the "Book Now" function on the first page of the website--try it! Pets must be house-trained and are not allowed on furniture. An additional cleaning fee may be charged for pets. For more than 4 guests, there may be an additional cleaning fee of 20 Euro. Please contact the owner if you require further information on rates. Monthly rates in the winter time may be subject to further discount than stated on website.